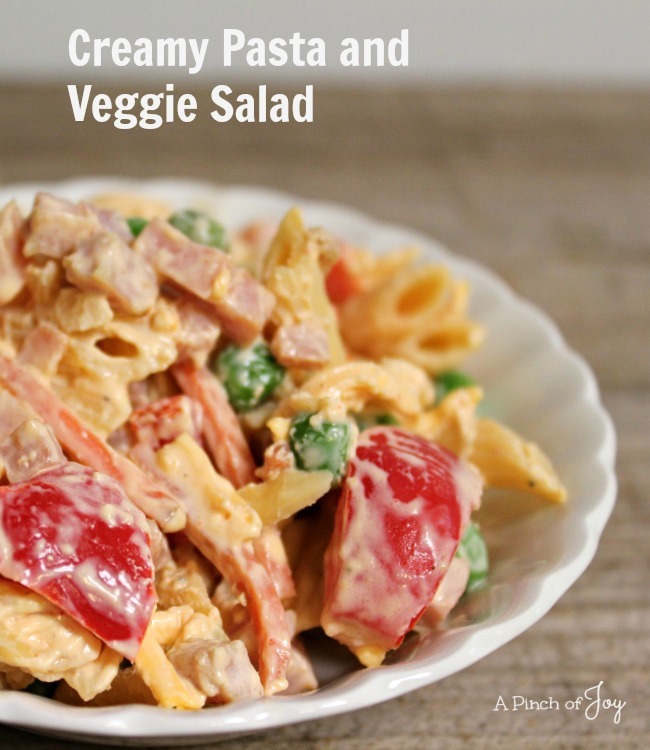 Creamy Pasta and Veggie Salad makes a great dinner salad for cool summer eating. It’s also perfect for potlucks and family. However or whenever, this salad makes an appearance it is a well balanced blend of carbs, veggies and proteins. It’s healthy and makes a big salad so it will serve a large number of people – or be a made ahead dinner salad a couple of times for three or four eaters. It’s also a nice change from mayo dressed salads and always disappears quickly. I like for my ingredients to “even out” so there aren’t little bits of leftover ingredients setting around. Three cups of dry pasta is generally about a 16 ounce package. That’s what I use if the dry pasta measures out between 2 ¾ cups and 3 ¼ cups. Any less and the salad won’t have the pasta base needed to carry the other flavors and foods. Any more and the salad could end up dry and low on flavor. Half a small onion will come out to about ¼ a cup. We always have raw veggies in the fridge so half a pepper or a few celery ribs is okay because that’s enough for another dish. But if there is a bit of anything left that won’t get used, just dice it up and add it to the salad. I have also used packaged shredded carrots for salads. For this one, I buy a package of diced ham and a package of shredded cheese, to save time. This is one of the “flexible” dishes where you can substitute what you have on hand, adjust the quantities to suit and it will still be good. If it seems dry after refrigerating, stir in a couple of tablespoons of milk to moisten without changing the flavor. Cook pasta according to package directions until al dente. Drain, rinse with cold water. Mix sour cream, French dressing, seasoning in medium bowl. In large bowl, mix together pasta, vegetables, cheese, and ham. Fold in dressing. Cover and chill 2-4 hours before serving. Best if refrigerated overnight.